Just as the shopping seasons guide demand in many categories, they shape the conversation around these categories as well. How do shopping holidays like Cyber Monday and Boxing Day affect review usage? Do gift givers and receivers write feedback differently? What does review traffic reveal about back-to-school shopping around the world? How do travelers’ hotel expectations change from season to season? When are mobile reviews most important? We analyzed over 100,000 pieces of feedback across North America, Europe, Asia, and Australia to answer these questions and uncover new trends. 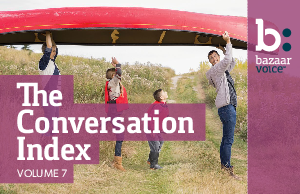 Download the latest edition of The Conversation Index to dive into annual global shopping trends and see how customer conversations ebb and flow with the seasons.